ANZAC Day 2015 marks the 100 year anniversary of the landing at Gallipoli by the Australia and New Zealand Army Corps. In WW1, they signed up into the unknown. For King, for Country, for their loved ones. It was the first war of its kind and a lot of that first intake of soldiers (and nurses) really didn’t have a solid idea of exactly what they were heading into. I was present for an ANZAC Day address in 2013, where Major Simpson spoke of how part of the strength our troops take overseas is given to them by their partners and families back home. On an active deployment there is both a goodbye and a promise that it isn’t a goodbye. In this series of emotional photographs we’ve sought to recreate those moments. 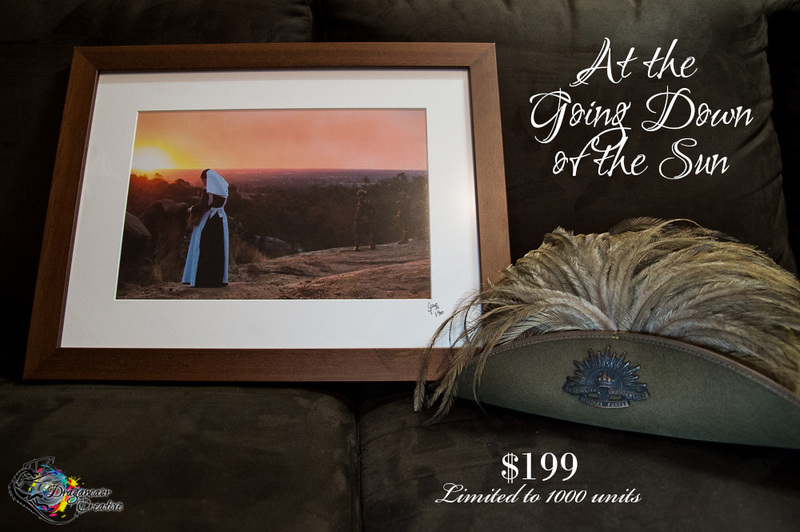 The sale of these photographs will benefit two specific charities equally: The Returned and Services League of Western Australia (RSL WA) and Legacy. This strictly limited edition release has the potential to donate more than $100,000 to each of these charities. The Returned and Services League (RSL) preserves the history of those who suffered or died for Australia, and look after our troops – especially their health – on return. Legacy is a charity that looks after the spouses and dependents of deceased Defence personnel. The single frame triptych shows freshly signed up Australian Imperial Force (AIF) soldiers saying goodbye to their betrotheds and preparing themselves for their future. Saying goodbye, but making a promise to return. 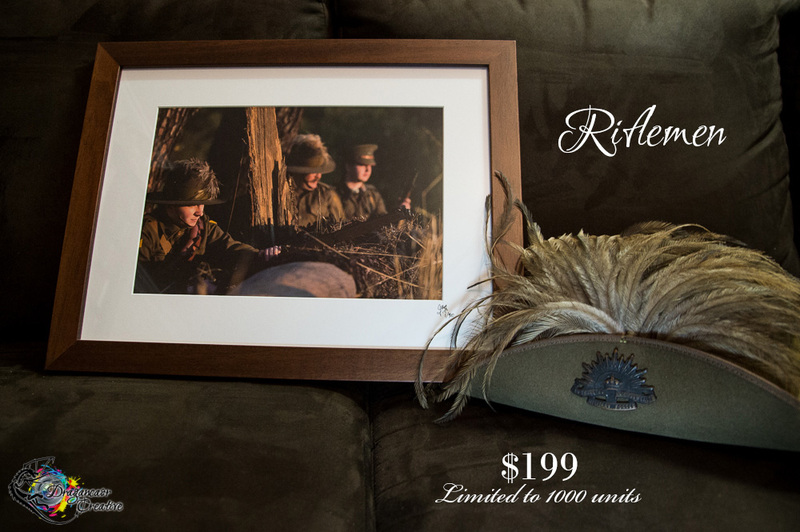 The series of three single framed photographs depicts a Nurse, 10th Light Horse troopers, and a private from 11th Battalion Australian Infantry. The first photograph shows the boys with rifles readied. The second photograph shows the famous ANZAC pride and mateship. The third photograph, of the Nurse reaching into her bag at sunset while soldiers on the cliff edge look back to her, symbolises the Ode. These photographs have been custom timber framed in Perth, Western Australia to complement the photographs and are of an exceptionally high standard. The triptych, Promises Amidst Goodbyes, measures 810mm long x 360mm tall. Each of the single framed images measure 450mm long x 350mm tall. All four frames have been made from the same wood, all 30mm wide, so they will match perfectly for those people who want the full set of photographs. 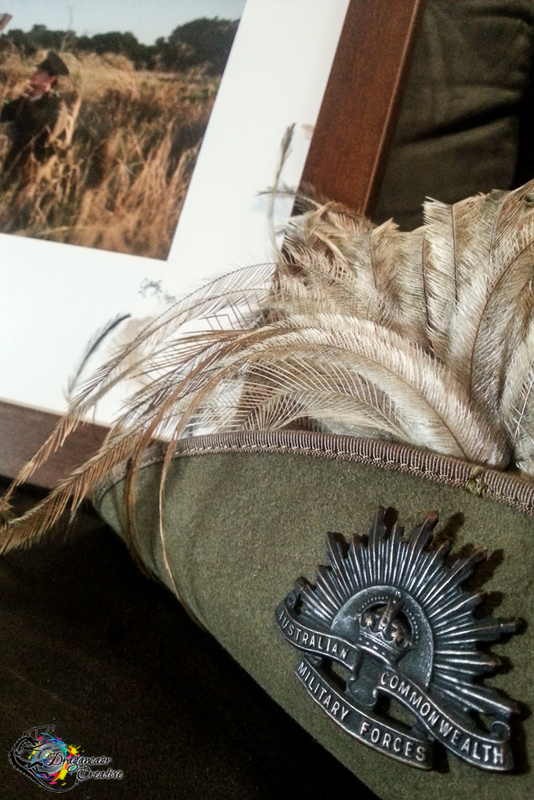 I’ve shown them with a WW1 era 10th Light Horse slouch hat (complete with Emu feathers) for an idea of size. The hat is not included in the sale, though it does feature throughout the series. The high quality, acid-free mat boards have been signed and numbered to identify them uniquely in this strictly limited edition release. Each piece has its own Certificate of Authenticity with matching signature and number, and including the details of the charities benefiting from your purchase. 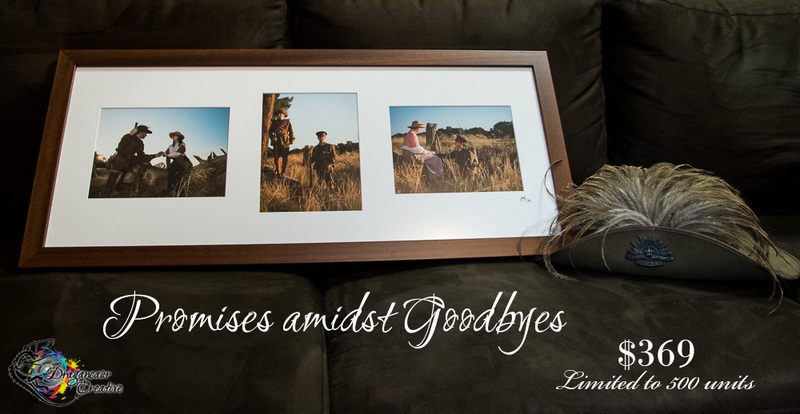 The Promises amidst Goodbyes set, is limited to only 500 pieces worldwide. 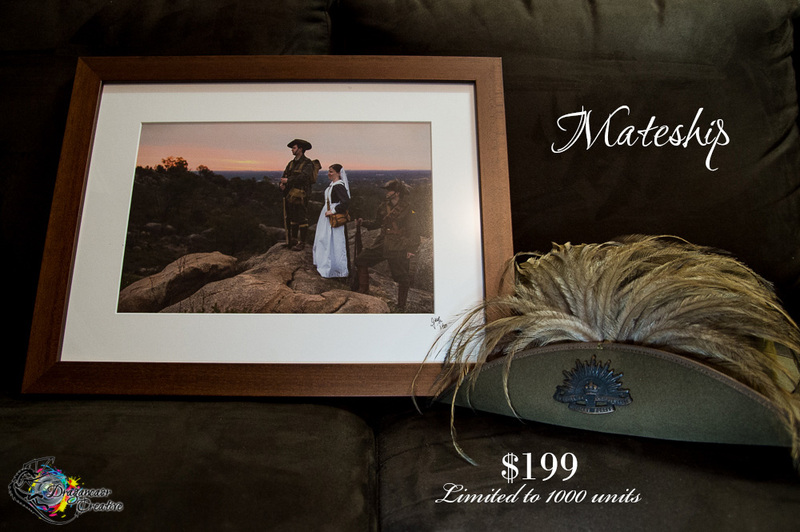 Riflemen, Mateship, and At the Going Down of the Sun are limited to only 1000 pieces each worldwide. Once the extent of those numbers are reached these special images will be retired. There has already been international interest in this release, so you will want to get in before they’re gone! To order one or more of these emotional pieces, please email me. Payment options include direct bank deposit (AUD only) and PayPal. Postage and Freight are currently still being negotiated, as we want to ensure it is affordable but also that your newly purchased artwork is insured during transit. If you are in Perth, Western Australia, I am happy to arrange with you to collect it personally. Please note that you will need proof of ID as well as receipt of payment (PayPal receipt or bank receipt), so that I can make sure I am giving it to the person who purchased it. Every time you look at these beautifully crafted artworks on your wall, you will be reminded of the service of our troops and nurses. Not only that, but you will know that you’ve directly helped the support agencies for our returned and currently serving men and women. This project is not affiliated with the Australian Defence Force (ADF), the RSL, nor Legacy. They have not commissioned me to do this. This fundraiser is purely because I support the latter two organisations and have the skill and ability to raise that support to something as large as this. I could just keep buying poppies and Christmas cakes, but this will help RSL & Legacy so very much more! You can read here to find out why this series is so very important to me. This project was huge and would not have occurred without the help of a number of people. You can read this post to find out more about how this series was put together, from concept to reality.